I must say yes it does. I can tell you from personal experience it makes all the difference. Let’s look at why. 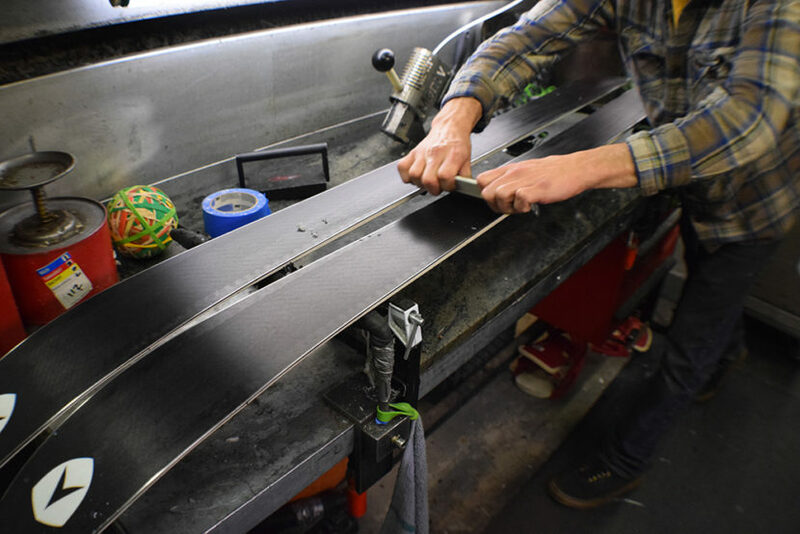 A simple way to think about why waxing your skis and snowboards can make a big difference to their performance would be three words materials, temperature, and friction. There are lots of factors that will affect you glide but we’re just looking at wax here. First, let’s look at materials. All skis and snowboards bases are made out of (UHMWPE) “Ultra High Molecular Weight Polyethylene” a type of plastic that is very resistant to abrasion. It is resistant to abrasion but friction is created when it slides through snow. This friction affects your glide in different ways in different snow conditions. Second, let’s look at temperature. As the temperature changes the snow moisture content changes. This effectively makes up different kinds of snow conditions and this changes how the friction slows you down. Think about wet snow. The kind of snow with a higher water content that is easily made into snowballs. As a ski slides over snow in warmer temperatures the friction easily melts the rounder granular snowflakes. This amount of melt creates a suction on the UHMWPE plastic base slowing you down. Warm temperature wax can help with this. Warm temperature wax is a softer wax that adheres really well to UHMWPE bases. It lasts a long time and helps to repel the water and reduce the suction that is created by friction. This will help you glide rather than slow down in warmer conditions. Now think about dry powder like snow in really cold conditions. This kind of snow has a lower water content and it cannot be made into snowballs it just won’t stick together. As a ski slides over snow in really cold temperatures the friction is not enough to melt the sharp perfectly shaped powdery snow flakes. Warm temperature wax will not help with this. Warm temperature wax will not work in this situation because it is soft. The sharp powdery snow flakes will stick to it and slow you down. But cold temperature wax is harder and therefore the sharp snowflakes slide over it easily reducing friction. This will help you glide rather than slow down. But cold temperature wax is harder and therefore does not adhere as well to UHMWPE bases. As a result this wax does not last a long time. As the sharp snowflakes slide over it they scrape it off over time. What about all temperature wax? All Temperature wax tries to be the best of both worlds. A good way to think about it is that it is a blend of both cold temperature wax and warm temperature wax to try to maximize its useful temperature range. Finally, Friction and suction are the two forces that slow you down while skiing and snowboarding. Wax will most certainly help. Wax reduces drag in different ways in different temperatures and different kinds of snow. If you have your skis or snowboard hot waxed at a ski shop at the resort you will have the right wax to make you glide fast. If you wax your own skis and snowboard all you need is collection of warm temperature wax, all temperature wax, and cold temperature wax bars. With a little time and practice you will be able to select which wax will work best for you in the current conditions. You will also learn to blend some of this temp and that temp bar to make your wax last longer on the snow. Have fun wax often and enjoy the glide. What kinds of wax does Quickiewax sell?